Six weeks after they started rocking French politics and a month after violence erupted on the Champs Élysées, the Yellow Shirts remain both highly visible and highly enigmatic. The question now is whether the movement will find a political voice, and, if so, which one. The Yellow Vests are both highly visible and highly enigmatic. Their rebellion started with the occupation of roundabouts all over the country, but it made headlines with violent demonstrations in Paris. They have kept the support of some 70% of the population and nearly three million have people signed up on the “Official Yellow Vests Counter” on Facebook, but their protests never exceeded 300,000 participants – far fewer than in past union-organized demonstrations against social reforms. They have been ubiquitous on the news channels but have no real spokespersons. When, at the peak of the crisis, Prime Minister Édouard Philippe called for a dialogue and opened his door, nobody showed up. It is not easy to find out what they really want. The Yellow Vests have mutated twice already. The uprising was initially triggered by the announcement of additional fuel taxes, intended to encourage a reduction in carbon dioxide emissions. But after the government canceled the planned tax increase, stagnant purchasing power became the focus of the protests. Again, the government gave ground: President Emmanuel Macron announced on December 10 the repeal of tax hikes for pensioners and a top-up of in-work social benefits that will increase the income of people living on the minimum wage by 8.5%. The protesters responded dismissively and emphasized political demands, including greater scope for direct democracy, especially through popular referendums. What motivated the initial protests is clear. Energy taxes are regressive: low- and middle-income people spend a large share of what they earn heating their homes and refueling their cars. In recent decades, many middle-class households have moved to places far from work where housing is cheaper (France has Americanized considerably in this regard). They regard carbon taxes as unfair – the rich don’t pay them on air travel, and metropolitan hipsters benefit from subsidized public transport. To make them acceptable, proceeds should either have been devoted to supporting the green transition or explicitly redistributed in the form of across-the-board tax cuts. For budgetary reasons, support measures were limited to the bottom 10% of the population. People immediately above felt neglected and squeezed. They took to the roundabouts in protest. It is less straightforward to understand why so many lower-middle-class people feel unable to make ends meet. While median household income stagnated in the United States and Germany since the turn of the millennium, that was not the case in France. Despite the financial crisis, real household income increased by 8% from 2007 to 2017 – more than in many other European countries. Furthermore, there was significant redistribution along the income ladder. Changes in taxes and transfers took away 5% of the income of the top 10% and increased by 5% the income of the bottom 20%. Part of the explanation is demographic: aging and the rise of single-person or single-parent households have increased the number of consumption units and decreased their individual purchasing power. Part is sociological: middle-class consumption standards – mobile phones, restaurant dinners, and beach holidays – have risen in line with the income of the well-off and have become hard for the middle class to afford. Part is geographic: since 2000, the metropolitan areas have done quite well, whereas smaller cities have struggled. House prices have risen in the former but fallen in the latter, making their owners poorer. No wonder there have been many more Yellow Vests in cities with 50,000 inhabitants than in Lyon or Toulouse. The deeper issue is that many middle-class people feel that the social contract is broken. They once believed that rising levels of education would bring better jobs, higher income, greater prosperity, and upward social mobility for their children. But growth has become too meager to generate significant increases in income, middle-class jobs are threatened by the digital revolution, and competition for access to the best schools increasingly seems skewed to benefit those already on top. A deep-rooted French pessimism only reinforces their anxiety. Macron had the right diagnosis. He spoke of people being relegated and deprived of opportunities. He wanted to unlock growth, foster mobility, and promote equality of access. He correctly said that with public spending far higher than in other advanced countries, more taxes and social spending cannot be the answer. But he underestimated the magnitude of the change in perspective he was calling for, and he failed to respond to the demand for fairness in the design of reforms. His first moves – cutting the wealth and capital-gains taxes – earned him the sobriquet “president of the rich.” Never mind that these taxes sometimes captured all real capital income, or that, given budget constraints, the decision to front-load cutting them and backload tax cuts for the middle class was economically rational. Politically and socially, Macron was seen as serving the wealthy. As a result, a desire for insurrection has now taken root in French society. 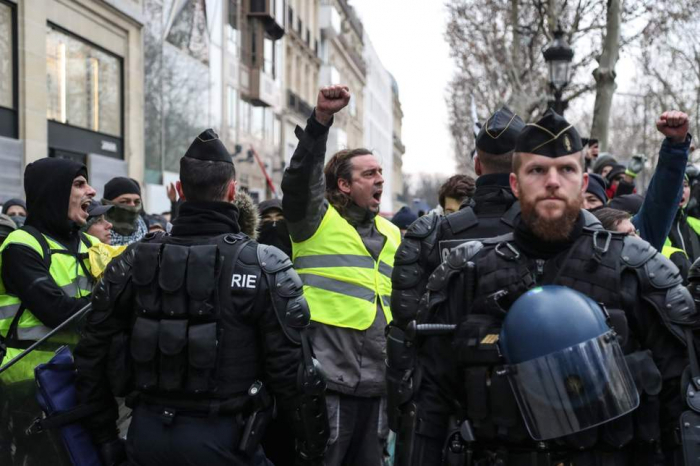 The left and the right have shamelessly pandered to the Yellow Vests, without offering real answers. The winner may well be Marine Le Pen’s far-right National Rally (formerly the National Front). Alternatively, the Yellow Vests may end up creating a party of their own ahead of the European Parliament election in May. But it is not clear what such a party would stand for. Anecdotal evidence suggests that whereas the movement is broad-based socially and politically, activists within it are closer to the hard right and include outright anti-Semitic and anti-Muslim types. People from across the political spectrum have shared the same anger on the roundabouts. An entire segment of French society that felt unrepresented and nearly invisible has found a color and begun building an identity. The question now is whether the movement will find a political voice, and, if so, which one.